I’m a big believer in libraries. I especially love free and public libraries. When I lived in southern Maine I had access to a well-funded library with 2 full-time children’s librarians and an excellent selection of new-release books. Now that we are living Downeast, things are different. Our new community faces a lot of economic hardship–which leaves the local library underfunded. It’s unfortunate, because in a community such as this, access to a library is more important than ever. The children’s room here is wonderful–it is warm and welcoming, and my daughter loves going there to read and play. However, the book collection is smaller, and has fewer shiny new books in it. They also only have one children’s librarian, who is there only 12 hours a week. As a family spending a year living on my partner’s Americorps stipend, we’re not in a position to help financially. As much as I’d love to personally purchase a beautiful new selection of books for our library, it’s just not possible. However, I did realize last week that I can give my time. It’s actually a perfect fit in terms of volunteer opportunity. I did work-study at the campus library in college, so I have some experience already. Since I’m volunteering in the children’s room, I can bring my daughter along with me. I LOVE kids lit. And, I am supporting an organization about which I am incredibly passionate. There are benefits, too. Obviously there’s the warm feeling I get from helping out my community. But I also get the chance to see what other people are reading when I re-shelf books. I’ve already started to find some gems I might have otherwise overlooked. I know that many of us feel like our lives are so busy, it seems impossible to squeeze in yet one more thing. But I would really like to encourage you to consider volunteering at your library. Even if you just spend an hour or two a week re-shelving, or repairing, or covering books, you’ll free up time for your librarian to focus their skills on bigger projects. And remember that most libraries accept donations of gently-used books. If your kid has outgrown those board books, they could find a new home at your local library, where many more children can enjoy and benefit from them. The Kid Lit Blog Hop hostesses are super-excited to unveil our new Kid Lit Blog Hop button. Tada!!! The Kid Lit Blog Hop began roughly 1 1/2 years ago and the original design for the button was drawn by my then 9 year old daughter, who complained that she could have drawn something much better if I hadn’t insisted on stick figures. While the old logo is certainly recognizable, we felt it was time to breathe new life into the Hop. Please feel free to grab the code for the button (below) and pop it up into your sidebar or elsewhere on your site. Big thank you to designbox1, who we found through Fiverr, for working closely with us in creating our beautiful new button. We also want to invite you to participate in the Children’s Book Week Kid Lit Giveaway Hop 2014 (May 12 to 18). Are you a children’s book or teen literature blogger, an author, a publisher, or a publicist looking to share copies of a fabulous book? Mother Daughter Book Reviews and Youth Literature Reviews are joining forces to provide you with the opportunity to take part in a Blog Hop featuring links to giveaways for fabulous children/teen’s books, gift cards, cash, or other prizes. What better way to celebrate Children’s Book Week? On to the Kid Lit Blog Hop! Welcome to the 37th Kid Lit Blog Hop where twice per month (the 1st and 3rd Wednesday) we continue to develop a dynamic and engaged community of children’s books bloggers, authors, publishers, and publicists. So, you are always more than welcome to join us by popping in a post and hopping around to meet some of your fellow Kid Lit bloggers and authors! We are pleased to welcome Divina from Beauty of the Picture Book as co-host this week. Please pop on over and give her a quick hello and welcome and be sure to follow her as specified below. Welcome Divina! 3. Please visit AT LEAST the TWO LINKS directly ahead of your own and leave them some love in the form of a comment. We are trying to build a community of bloggers, readers, parents, authors, and others who are as passionate about children’s literature as we are so please CONNECT and follow any or all of the blogs that interest you! 4. If you like, grab the button above and put it somewhere on your blog, preferably the post you’re linking up. If you’d prefer, you can just add a text link back to this Hop so that others can find it and check out all these great book links! 5. It would really help us get the word out about the Kid Lit Blog Hop if you would be so kind as to tweet, share, and spread the word about the Hop! 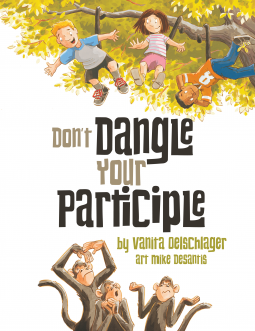 Today’s book review is for Don’t Dangle Your Participle, written by Vanita Oelschlager, illustrated by Mike Desantis, published by Vanita Books. It is scheduled to be released on May 1, 2014. I recevied an electronic copy of this book from the publisher, through NetGalley, in exchange for an honest review. “What on earth is a participle and how does it dangle?” That’s the opening question in one of the most entertaining grammar guides I’ve encountered. With clear explanations and amusingly illustrated examples, Don’t Dangle Your Participle helps to demystify a sometimes confusing topic. Oelschlager begins by laying out a brief grammar lesson for her readers. Her relaxed conversational tone, complete with colloquial language makes the subject accessible to children. It’s a pleasant departure from the traditionally dry language of English textbooks. Oelschlager recognizes that if we want young people to learn, we need to be able to address them in their own language. The rest of the book is a series of examples. First we are shown an incorrectly formed sentence, then on the following page the corrected form. But what makes it so effective are the clever illustrations of Mike Desantis. The pages with the incorrect sentences will have you laughing. From skateboarding deer to gluttonous cakes on the run, he helps students to see the problems that arise from dangling participles. His ink and watercolor cartoons are lively and engaging. This is the sort of book that deserves to be in classrooms and on homeschool shelves. It makes a traditionally dull subject amusing and engaging. More than that, though, Oelschlager demonstrates an understanding of how children best learn–not just by rote, but by engaging multiple senses. A solid educational resource, Don’t Dangle Your Participle earns 5 out of 5 stars for its laugh-while-you-learn approach.